Young hero Varun Tej is all set to team up with director Krish for a new movie. 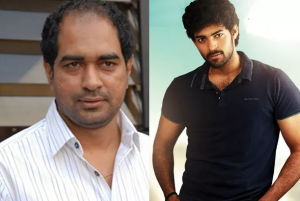 Latest Entry from Mega family young Varun Tej’s second film launch date cofirmed to be on 27th of February, he will be acting in the direction of talented director Jagarlamudi Krish.the muhurtham shot for this film is fixed on February 27 at Rama Naidu studios. Varun Tej’s debut film may not have clicked at the box-office. But director Srikanth Addala is succesful in showcasing his strengths, his screen presence and impressive looks were notable from his first film. His Krish who is known for his unique scripts like Gamyam, Vedam, Krishnam Vande Jagathgurum coming up one such storyline with Varun Tej. Krish is currently making ‘Gabbar’, remake of ‘Tagore’ in bollywood. Mega fans expecting Varun Tej to excel in every domain of performing, mega heroes have this second film sentiment, where every hero scored a good hit. Varun’s dancing skills to will be tested.